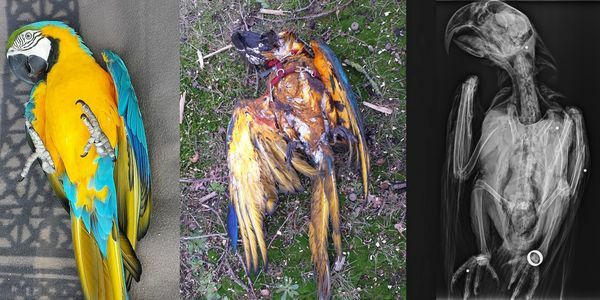 On the 29th of December 2018, close to a town called Westmalle in Belgium, a free-flying pet blue and gold macaw was shot and killed by a hunter. The hunter, a 53 year old man from the town of Deurne, stated it was his right to kill any animal not native to the area. The parrot was a pet bird who was trained to fly free outside by his owner Joseph Verdyck. - It has been scientifically established that an non-native (exotic) animal species causes damage. Thank you so much for helping us out to protect all pets in Belgium! One minute, Rambo was flying free through the sky in Malle, Belgium, the next minute he was a cloud of feathers and blood. In the blink of an eye, I saw my beloved pet macaw blown out of the sky and plummet to the ground. Minutes later, dogs pounced upon Rambo's lifeless body and devoured him. I was in shock. I looked around to see what could have happened and saw a group of hunters. When I confronted them and told them that they had shot my parrot the man simply apologized and said he thought he would shoot it because it wasn't "illegal to kill exotic birds" in Belgium. The man eventually offered to reimburse me for my financial loss, but that is not enough! I raised Rambo and my other macaw Mera from hatchlings, and I even taught them to fly. The day Rambo was shot I had taken them out to a nearby field where they could get some exercise. Like many parrot owners, I let them free fly and I had trained them to come back to me. In fact, according to experts Rambo was one of the best trained birds in the country. And now he is dead. Sign the petition and tell Malle officials to prosecute the hunter and strip him of his hunting license.